With fall finally getting here it's always time to be Thankful for everything in our lives. 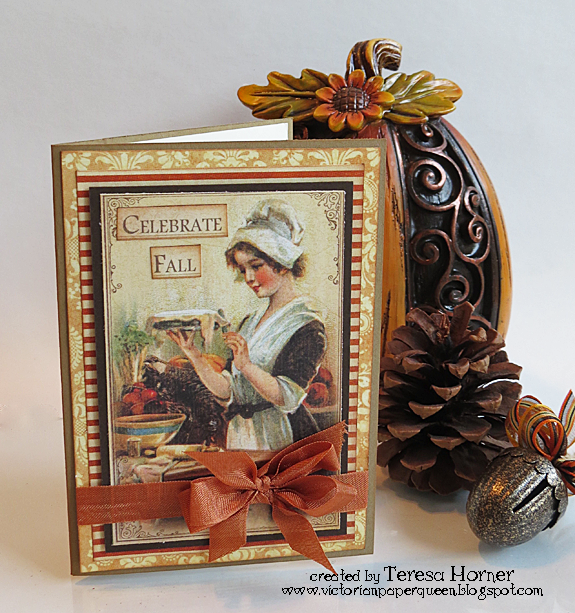 Today I am doing a quick share with a card and little goodie box I did with some gorgeous fall ribbons and Graphic 45 papers. For my projects I chose some of the "Seam Binding Ribbon" in burnt rust and "Tuftan Brown Satin", "Brown Plaid" and my new favorite 3/8" inch lace called "Gabrielle" in ivory. The papers are a mixture of Graphic 45 papers I had in my stash but most of it starts with the cut outs for the Calendar pages. I really love how this one came out. 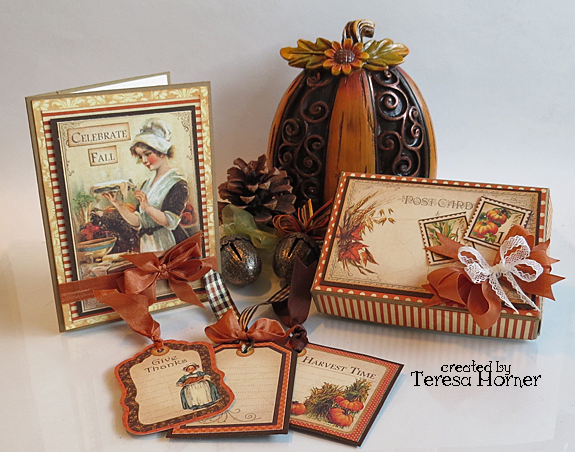 The colors are so rich and pretty and the ribbon reminds me of the color of pumpkin pies so it was perfect to use. 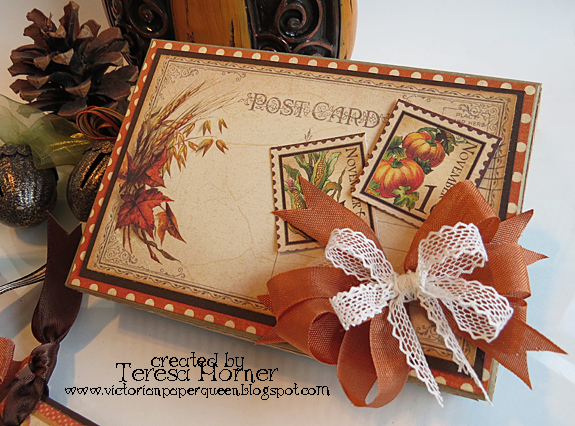 For my box I used a Scor-pal and created a pizza box that the top post card tag would fit onto. It's fun to make custom boxes and you can fill them with lots of fun surprises for the person you are giving it to. For this I also used the seam binding ribbon and that pretty little lace I was telling you about. 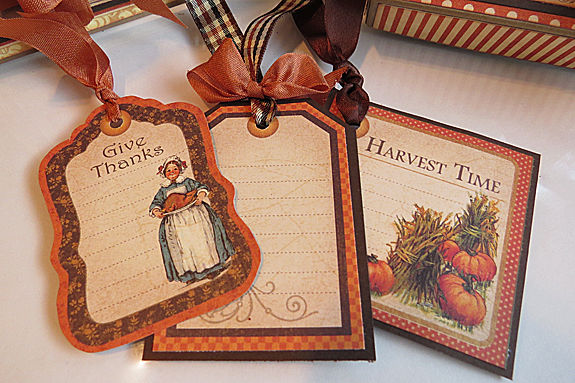 Lastly I made up some quick tags to go on some kraft bags I have to fill with goodies to give. The prints are so pretty and the ribbons go perfect with Graphic 45 papers. Thanks so much for stopping over and have a really great day!! WOW! Such a wonderful post!! Absolutely Gorgeous!! Stunning gifts! The colors are breathtaking. 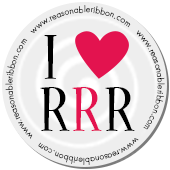 I love these, so gorgeous and the ribbon really takes it to the next level! just beautiful! makes me ready for Thanksgiving right now! :) the tags are fabulous, too.